Code: Realize - Future Blessings (コードリアライズ - 祝福の未来, Code: Realize - Shukufuku no Mirai? 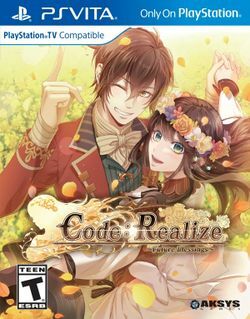 ), stylized as Code:Realize ~Future Blessings~, is an otome visual novel developed by Otomate and published by Idea Factory for the PlayStation Vita. It is a sequel to Code: Realize - Guardian of Rebirth, featuring scenarios that take place after the conclusion of each of Guardian of Rebirth's true ends. It also features a side story about a run-in with the mafia that takes place during the first game's common route, routes for side characters Finis and Herlock Sholmes, and short stories about the young son of the late king of the vampires, Delacroix II. Idea Factory published Future Blessings in Japan on November 24, 2016, two years after the first game in the series. Another year later, it would be followed by its own sequel, Wintertide Miracles. Future Blessings was published by Aksys Games in North America on March 30, 2018 and in Europe on April 3. It was also released for PlayStation 4 alongside Guardian of Rebirth as part of the Bouquet of Rainbows compilation. This page was last edited on 20 February 2019, at 19:31.